When time is short and you need a quick card...make these circle punch cards in no time at all. Have you ever been asked to produce a card at the last minute...like now!! And you don't have time to print, stamp or colour an image. Most of us have a circle punch and probably several, in different sizes too. Punch out lots of circles in all the sizes you have, and use the scalloped edge ones too, if you have them. Save what you don't use on this project, for the next time you need a quick card. I have used a mix of plain and scalloped edges, in three different sizes, and inked all the edges. And as long as your colors blend you could use a mixture of patterns. This card was made as a Tri-fold Card with the third panel removed. 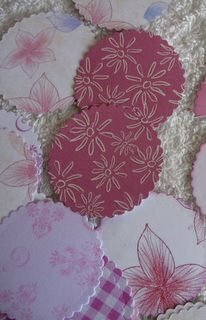 Add the circles to the front, and use several of the sizes, layering them up on top of the larger ones. Add gemstones to the spaces, and some of the circles, and add a sentiment. This card has had the middle taken out of the large circles. 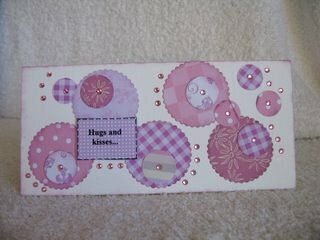 The layered panels are glitter and textured card. The ribbon was stuck to the panel and the cirlces laid over the top with foam pads. 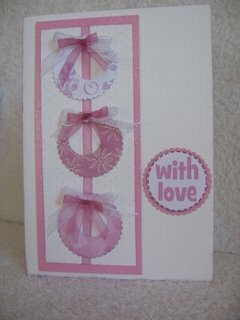 Bows and a sentiment complete the look of these Circle Punch Cards. A quick and easy solution when time is short. Now I know they are pink...but if you make them in blue, green, brown, coffee and cream, turquoise or any other color they can be just as suitable to send to the men. Spots, stripes, abstracts or squares...just don't add the flowers! !